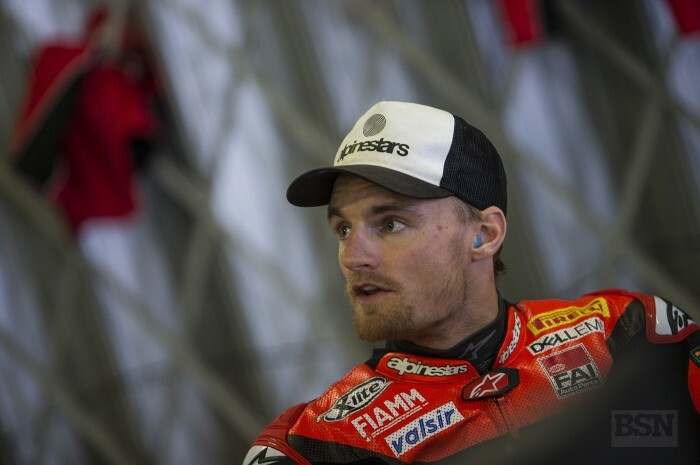 After setting few laps on day two at the Jerez tests due to a muscle spasm affecting his back, Chaz Aruba Ducati’s Davies continued testing at Portimao, despite still having issues to deal with in his physical condition. The very nature of Portimao – dramatically undulating, bumpy in places and with lots of changes of direction across the bike - did not help him get back to normal either. “This year I rode here in the summer injured and not feeling quite fantastic these couple of days either, so this track is probably one of the worst, I would say,” stated Davies. “You are jumping all over the bike and the rear is kicking quite a lot and it felt like I was on a motocross bike at times. Davies first had a flare up from an occasional problem with his back, linked to two slightly swollen discs in his vertebra, in he middle of his post Christmas training regime. “I had a twinge a couple of weeks ago so I had a week off the bike, and it came back pretty quickly, on the first day riding the bike. I did not expect that from that first twinge. Normally rest is what does it.